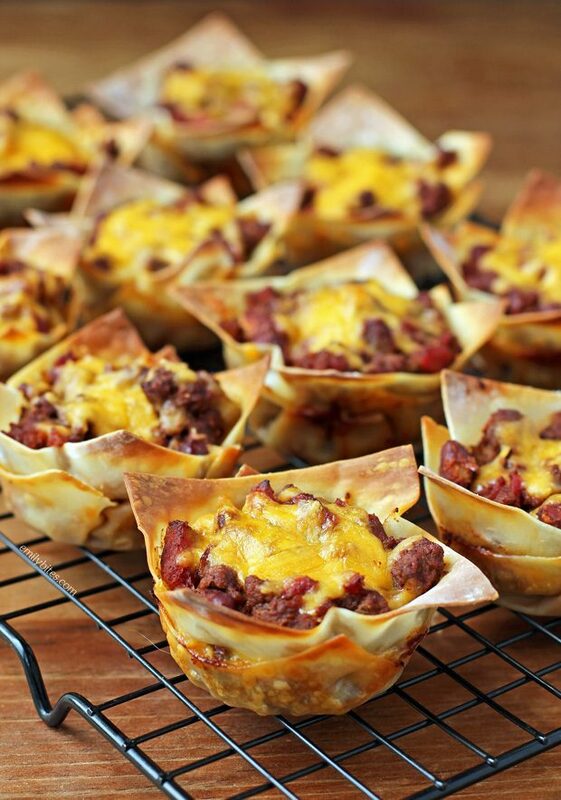 I have made a lot of varieties of wonton cups over the years, but these Chili Wonton Cups are now one of my favorites! 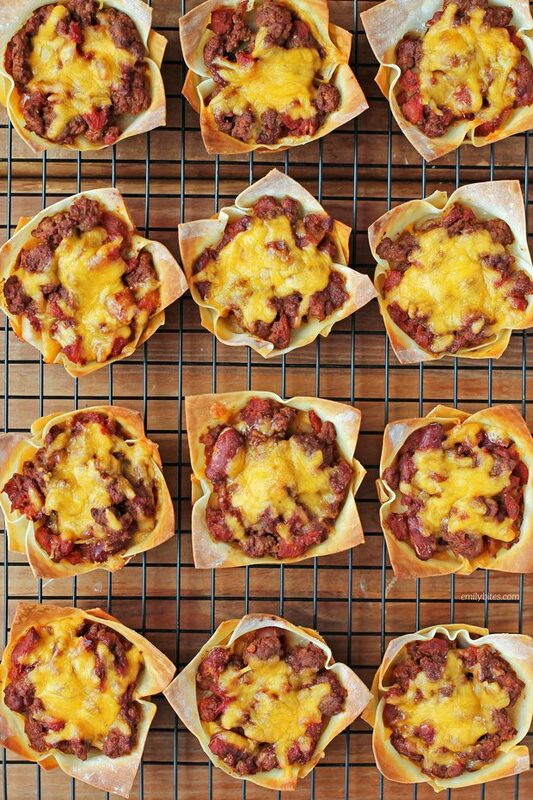 These hearty little cups are meaty, filling and perfect for an easy weeknight meal or as a finger food while watching the game. Double decker layers of meaty, spicy chili smothered in cheddar cheese and nestled into crispy wonton cups = comfort food perfection. Each of these Chili Wonton Cups is just 124 calories or 3 Weight Watchers SmartPoints, so you can easily select your perfect portion. These cups are family friendly and the leftovers are perfect for lunches! Looking for more ways to use wonton wrappers? I’ve got you covered! Check out my recipes for Pizza Wonton Cups, Chicken Parmesan Wonton Cupcakes, Chicken Pesto Cupcakes, Chicken Bacon Ranch Cupcakes, Mini Cinnamon Apple Tarts, Taco Cupcakes, French Dip Cupcakes, Reuben Cupcakes, Turkey Club Cupcakes, Berries and Cream Cinnamon Dessert Cups, Buffalo Chicken Cupcakes, Cheeseburger Cupcakes, Lasagna Cupcakes and many more! Place the ground beef in a medium skillet and bring to medium heat. Use a wooden spoon to break it up into small pieces as it cooks. When the meat is breaking up and almost browned, add the onions and the garlic and stir together. Continue to cook another few minutes until the meat is browned and onions are softened. Add the kidney beans, diced tomatoes, chili powder, salt, cumin and cayenne to the meat mixture and stir together until well combined. Reduce the heat to low and simmer, uncovered, for 10 minutes or until thickened. Push a wonton wrapper into the bottom of each of the sprayed cups in the muffin tin. Using about half of the chili mixture, spoon evenly into the wonton wrappers. Sprinkle about half of the shredded cheddar evenly over the top of each cup. Press another wonton wrapper on top and repeat the layering steps with the remaining chili mixture and shredded cheddar. Hi Emily, I just made these and they turned out great! Thanks so much for the awesome recipe. These were pretty good! I used my own turkey chili for the filling. My wonton wrappers came out a little soggy. I think next time I’ll bake the bottom ones on their own for a little bit first. Because I’m cooking for just myself, the stored leftovers also got a little soggier, but heated up nicely in an air fryer. Thanks for all the great recipes you do! Made these last night. LOVED them. Thanks for another great recipe! These were so delicious! Just the right amount of heat. My hubby even asked if we could eat them for leftovers the next night! Total win! I made this for dinner last night, and am eating leftovers for lunch today. Easy to make yet so delicious! Thanks for another great recipe Emily! I’m thinking of making these for a potluck at work, so I’d have to make and bake them the night before. Do you think reheating them in a microwave right before the potluck would work, or would the cups get soggy?